One of the most addictive games of bubble popping and matching goodness has arrived. 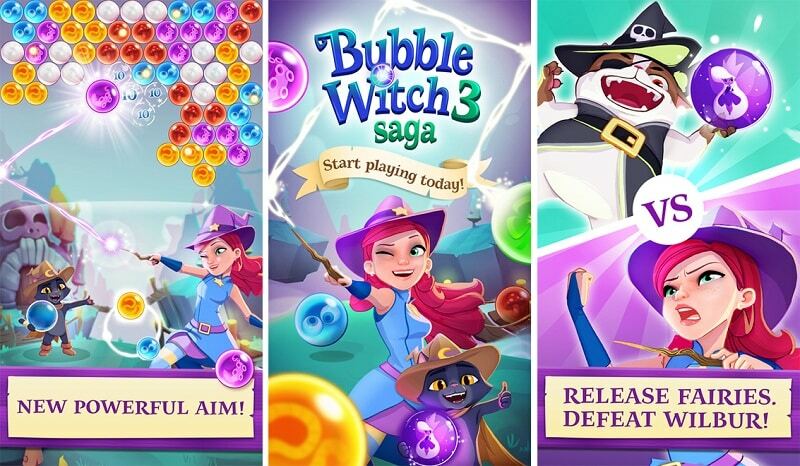 Bubble Witch 3 Saga is an enjoyable game that presents new features. On some stages, the goal is to clear all bubbles on a screen, but that is not everything. There is a stage where you set owl free by matching their colors accordingly. However, simply vanquishing them doesn’t work. You have to match them directly. 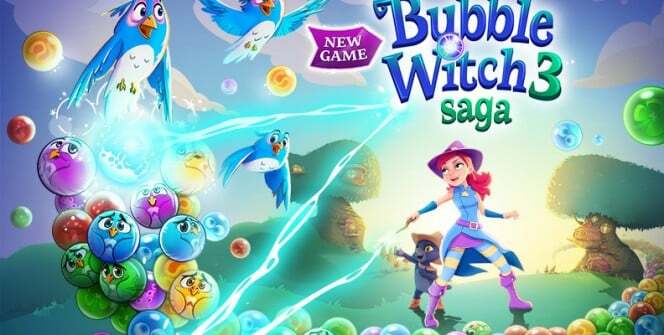 Bubble Witch 3 Saga focuses on solving puzzles, not just simple bubble clearing. In other objectives, you have to guide a ghost to a top of the screen. First, the goal is to clear the path, so strategic play is important at this particular moment. Problem is that you have limited number of moves, so you have to make every one of them count. Some objectives are the little bit tricky, but satisfaction is even better than the previous game. All premises and features are similar to the previous version. The idea is to shoot bubbles and finish the quest in order to progress further. There are new elements such as Stella’s House, so you are able to rebuild a house and to fill up the star bar while collecting Fairy Dust. Winning the game and breaking records helps you upgrade and customize Stella’s house faster. You would have learned counteract the common issue of useless bubbles, like in the previous game, but now there is a chance to do something about it. When you throw a bubble into Nero the cat’s hat, you get a power up. It is not quite great, but a significant way of improving that issue. There is also a way to create chain reactions by releasing fairies when you burst bubbles. It may feel like an unimportant feature, but it could make a difference when you run out of chances. It has a similarity as other free games; you can build a house, piecing it together with rewards you get while playing and breaking records. There are different rewards involved such as temporary unlimited lives and power-ups. Bubble Witch 3 Saga contains an iMessage version that gives you a chance to play it with your friends. You have to defeat the magic shield that belongs to Wilbur. This is a boss level and you need to shoot down bubbles in order to release trapped fairies. When you release them shield bonus arrives. The goal is to clear all bubbles on the board if you want to finish the Collection mode level successfully. You need to shoot as many bubbles as you can in order to clear the path. When the path is cleared it enables you to move on top of the board so that you can reunite with your potential friends. The name of this level explains everything. First, all you have to do is free owls trapped in bubbles for a limited time, and gather them in order to complete the level and move to the next one. Bubble Witch 3 Saga contains 220 levels with update potential that could be added later. 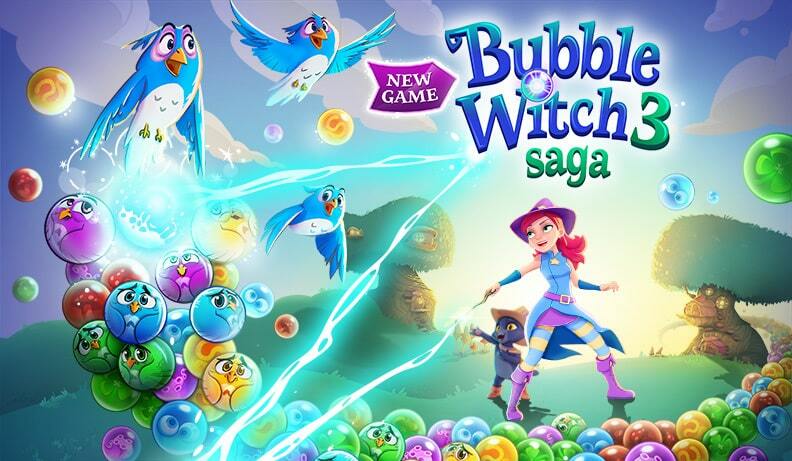 Compared to the earlier game, Bubble Witch 3 Saga manages to throw another, improved story. Sometimes when playing Bubble Witch 3 Saga, bluestacks ask you fee to pay but gives you option to download some apps. Every time it asks you just select “Install apps” and continue using it free. I hope you enjoyed this article, please rate and share. If you have problems running Bubble Witch 3 Saga on desktop or any other issues, leave a comment below.